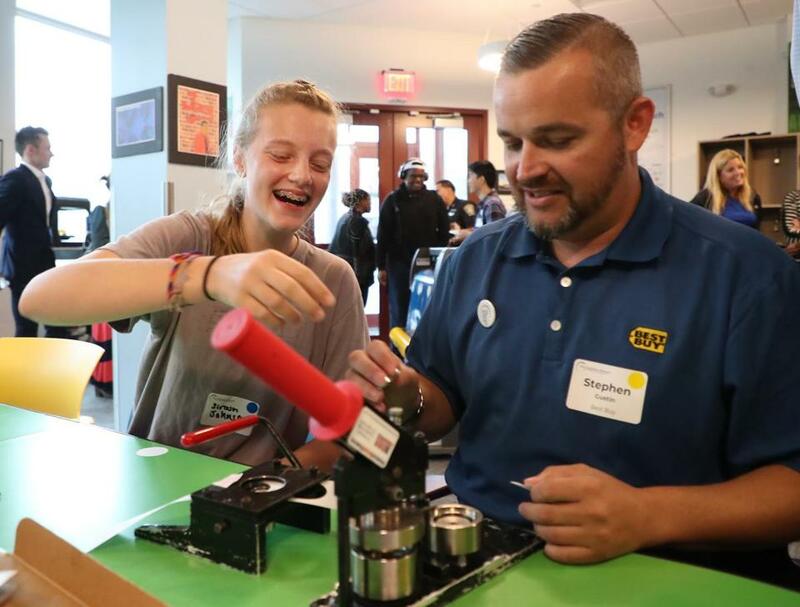 Siroun Johnson, 14, taught Best Buy’s Stephen Gustin how to make buttons during Tuesday’s opening of the new headquarters of the Clubhouse Network in Roxbury. Growing up between Dorchester and Roxbury, Kahmal London said his time exploring art and technology at the Clubhouse Network inspired him to pursue a degree in animation. Two decades later, he serves as coordinator of the nonprofit’s new flagship headquarters in Roxbury. On Tuesday, Clubhouse celebrated the grand opening of its new Dudley Square space, as members showed off their skills to the community by making music and programming robots. The Clubhouse Network was founded 25 years ago in collaboration with the Massachusetts Institute of Technology Media Lab to serve as a space for young people to use technology for creative self expression and collaborate with their peers and mentors. Since its founding, the organization has grown to 100 Clubhouses across the United States and in countries such as Australia, South Africa, Russia, and the Palestinian territories. Until now, the organization’s headquarters was in the Museum of Science. The new 1,600-square-foot space splits into two rooms: one for technology, one for workplace seminars. At the tech center, members can explore different worlds through a virtual reality headset or master Adobe Creative Cloud programs. The center features a recording studio and sound booth, as well as 10 programmable iRobot Create 2 robots. “Anything we can do to bring a child and a robot together leads to a good place,” iRobot chief executive Colin Angle said at the grand opening. In learning lab, the Clubhouse will host workforce readiness programs to complement the tech skills kids learn in the space. These classes will teach members how to network, apply for jobs, and dress in professional settings. To use the space, kids ages 14 to 18 just need to submit a permission slip with a parent or guardian’s signature. Membership is free. In the past five years, 100 percent of Clubhouse Network members graduated from high school. Most Clubhouses see more than 200 members per school year, Breslow said. Nick Flores, a 16-year-old high school junior, heard about the Clubhouse during seventh grade. Since then, he’s spent as much time as he can in the space making beats and socializing. Adaliz Rodriguez said her 13-year-old son found his confidence at the Clubhouse after bullies mocked his interest in drawing.